The RX8 does run the 1/4 in 14.5@95.6Mph, USA Magazine Road&Track Ran one that did those time, but i think it was for an older model non R3, nontheless it does it. 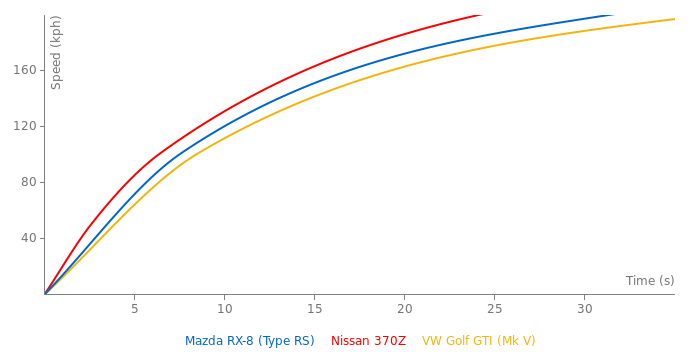 The 0-60 may be correct due to gearing as it needs just 2 shifts to hit 60. So yeah where's the crediable link showing an RX-8 posting a 14.5@95mph 1/4 mile time? Why are you planning on selling it if you don't mind me asking? I understand that the MPG isn't the greatest (by far) but other than that I have trouble finding much fault in it. Yes, it could be quicker but let’s be honest it's quick enough as long as you're in the right gear. 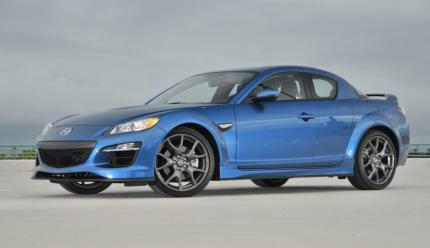 I hear they're offering 6yr/100k powertrain warranties on the new RX-8's. It’s not that RX-8’s are horrible unreliable (Not counting the earlier models [quote]mostly auto’s) but that sort of warranty is a nice selling point as long as you don’t plan on modifying the hell out of the car. I think that if one could get over the whole game the RX-8 R3 would be a great buy for around 30-31k with that 100k warranty. 16/22 MPG isn’t great but at least it’s better than an M3’s 14/20 rating and no worse than an EVO X which about the same as an M3’s. Where did the acceleration times come from for this car?? The quickest I've seen so far is 15.1@93mph for 1/4 mile Car and Driver. And I can assure you it takes a hell of a lot longer than 27.4s for this RX-8 to hit 124mph or 0-200kph. I own one, and I have to say, more power would be great, but this car still feels great to drive, it has brilliant power delivery and sublime handling. The rotor tips, or apex seals, should be changed in a rotary engine from time to time. Even with regular maintenance, they sometimes degrade too far at a moment's notice. Rotary engines that are pushing a lot of boost are notorious for blowing their apex seals, causing catastrophic engine failure. BTW Sinatra, the 13B-rew SHORTblock weighs a mere 125lbs. The longblock with all accessories (including both turbos) weighs over 400lbs. Don't believe me? Look it up. As for the triple rotor, such as the 20B, that motor wasn't put into the FD3S RX7 for production cost and weight distribution reasons. The engineers responsible felt the car would be nose heavy. I heard from someone that the rotor tips needs to be changed, quite often. Is it true? The Mazda RX-8 is one of the most fun cars to drive. It\'s just too bad it\'s so weak in the torque dept..
corrected the acceleration number to manufactor claim, at EVO magazine group test the car failed to reach manufactor claim, nice move from Evo magazine to name both manufactor claim and real tested numbers..
too bad this baby doesnt have 100bhp more:( 330 in an RX8..helllls yess.. I may be a Corvette fan, but this car rocks!